Do not let anybody choose your coatings. Hunt away boredom, and avoid the most common mistakes! New aesthetic trends in residential buildings are revolutionising the way in which house owners think and achieve the decoration of the living spaces. Even here in Switzerland, the times of the “grey boxes” are over: they are going out of fashion. The contractor of a new building wants it to express his character. This leads to a growing interest in mosaic. Mosaic has worked its way across the most diverse ages and cultures, reaching into our own times, without ever losing its eternal charm and elegance, which no other art can achieve. A mosaic installed in your house raises its value, and gives it its own character without the threat of ever turning obsolete or banal. 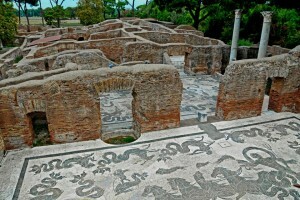 Look at the ancient floor mosaics, which are yet today admired all over the world! By employing the new techniques and methods, that skilled experts developed and tuned, craftspeople can reproduce both classical, elegant atmospheres, and modern original ones. Mosaic lends itself to any shape, materials can be polished or matte, marble or glass enamel; the choice of colours is almost unlimited, and so are the styles that can be fashioned. Depending on the furnishings, or the customer’s idea, existing themes can be reproduced or wholly new ones created. There is plenty to choose from, and the imagination can express itself freely, creating an artwork that is unique and immutable. Let us now shut our eyes and start a short trip inside your house. Think of a carpet, with the colours and motives you prefer; a carpet that lives in your imagination or your dreams, maybe you saw it somewhere and it impressed itself in your mind. Now imagine you can have it made …in mosaic! This means it will never change its hues, you will never need to beat it or take it to the cleaner’s. It will afford your room a touch of uniqueness, making the character of your daily environment closer to your own; you will never grow weary of it. Now imagine in which of the walls you may want to embed a decorative mosaic, or a reproduction in mosaic of your favourite painting. 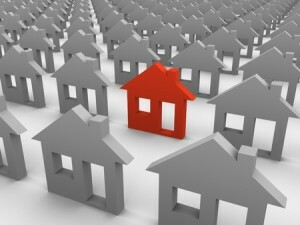 Fitting perfectly within the environment, always ready to give you a jolt of joy every time your eyes rest on it; joy because it is your own, and nobody else’s… you won’t find it in another house or in a shop. It is one of a kind, just the same as you are. A plain, simple decoration in the kitchen or bathroom area can give a totally new point of view to all the ensemble. It turns a common utility space, maybe even a bit underrated, into a new, lively environment. Because mosaic is movement, and creates movement. The collected tesserae give our brain a perception of movement: several separate pieces, joined in one but still perceived as separate, create this feeling of movement, of livelihood, of something always new. Even a simple mosaic frame can turn a mirror in a work of art. 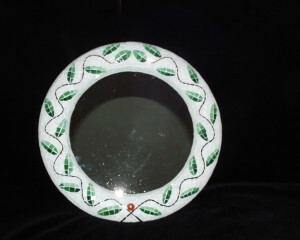 Due to its pliability, the mosaic technique can be adopted without effort in coating decorative objects or pieces of furniture. It lends change, elegance and high aesthetic meaning, even to the most unexpected places! 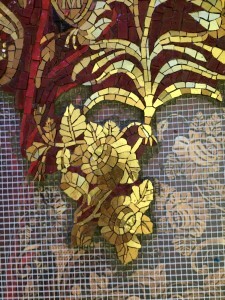 The statement I hear most often from customer of mosaic works is, “I thought it would be beautiful, but not like this! I am really astonished!” With a look in their face, that betrays a deep emotion! With glass enamels, the range of colour hues is endless: since they are man-made, all colour grades are possible, but nonetheless still charming. Tesserae are cut from slabs of glass (called “Pizzas”) which are molten together with colour pigments in special ovens. The best such “smalti” come from Venice, where specialised workshops have been handing the precious knowledge down along the centuries. This is where we shop for the best materials, both in beauty and quality. Did you enjoy this short trip in the world of mosaic? Then I suggest you make one from closer up, come touch this vibrant, splendid technique with your own hands, turn an idea into something concrete, unique and …magic!